There is an odd mix of desperation and uneasiness that sets in when you’re lost in a foreign country. Doubly so when you’re lost in a country like China. It took me about 2 seconds to realize my Chinese, which consisted of little more than “hello” and “thank you”, would be of little use in my predicament. Not that my wife and I were that far from civilization. We had started out the morning in Yangshuo, one of China’s tourist meccas. 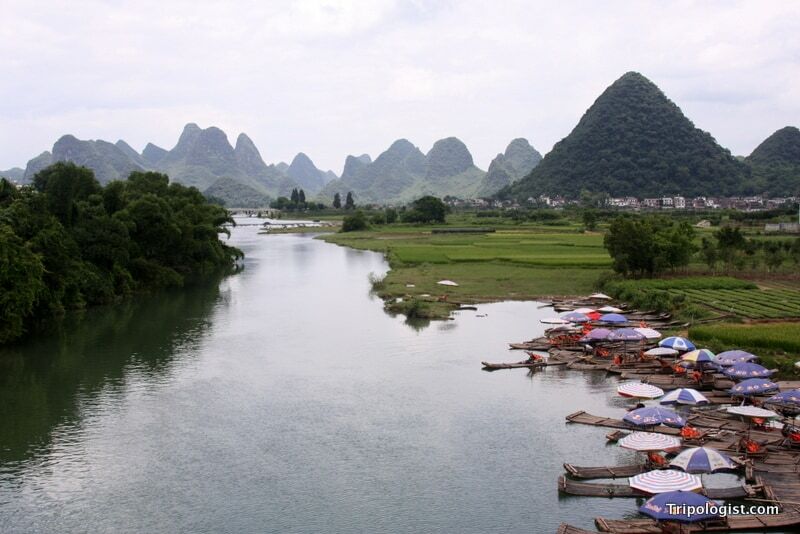 Located in the southeastern corner of China, Yangshuo is the central tourist hub for China’s magnificent karst region. With millions of tourists visiting annually and more hostels, hotels, and souvenir shops than you can shake a stick at, Yangshuo is the very definition of a tourist trap. 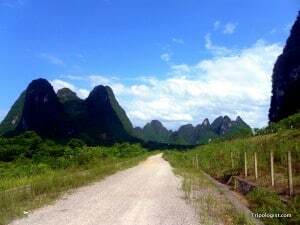 Wanting to explore the region and get a feel for the “real Yangshuo”, we decided to get out of town and explore some of the region’s world-famous scenery on our own. We woke up early and rented bikes from a small shop in town. Winding our way through the traffic-clogged streets, we navigated our way out of town and into the countryside. 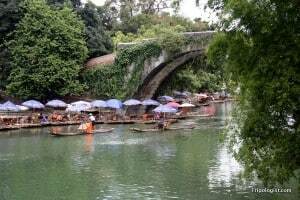 Our destination was Yulong Bridge, also known as Dragon’s Bridge, in the Yulong River Valley. Despite warnings from WikiTravel that, “the track is complicated and it is easy to get lost,” we headed out full of confidence. I mean, how hard can it be to follow a river upstream? Despite only having a vague idea of where we were headed, our trip started out reasonably well. As with most tourist destinations, we were quickly able to get away from the crowds and soon found ourselves biking along a quiet road, surrounded by lush fields and towering mountains. The route through fields and small villages was very beautiful and peaceful, but we had no idea where we were. As we biked further and further from town, we eventually come to the Yulong River. 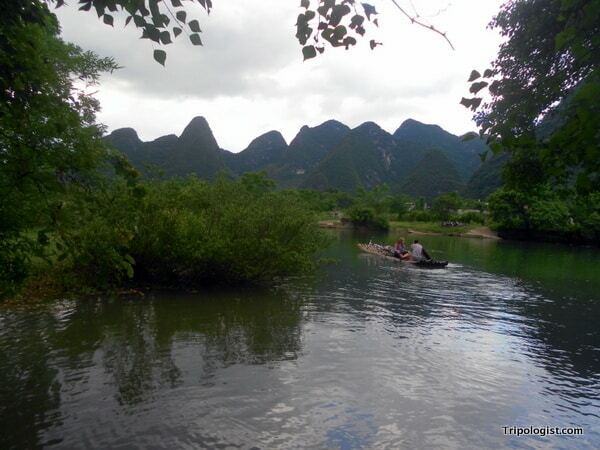 However, no sooner had we found the river than the road turned, heading off into the countryside surrounding Yangshuo. We quickly realized we had several options. First, we could go back to the river, cross at a nearby bridge, and try our luck on the other bank. Second, we could keep following the road we were on and hope that it would eventually return to the river. Or third, we could do what no sane person would do: take our bikes down a thin strip of dirt through rice paddies, hoping that we would eventually be led to the river, all while avoiding a fall into the water-filled paddies below. Of course, we chose option three. As we followed the narrow, serpentine path through field after field, we occasionally came to a small village and more than once had to move off the path to allow a motorbike to pass. By the stares we were receiving from locals, it quickly become obvious that we were on a path infrequently followed by western tourists, but there was no turning back now. Eventually, we emerged from the fields onto a road. However, at this point, we were so turned around that we had no idea where the river or our final destination lay. Fortunately, a lucky guess led us in the right direction, and we were soon starting at a beautiful stone bridge on the Yulong River that was well over five hundred years old. The beautiful 500-year old Yulong Bridge. Relieved to have finally arrived at Yulong Bridge, we sat down at a local restaurant. Mere steps from the water, we enjoyed a fantastic traditional Chinese meal while watching local kids playing in the water and Chinese tourists floating down the river on bamboo rafts. In Yangshuo, riding on a bamboo raft is as ubiquitous as riding in a gondola in Venice, Italy. As with the gondolas of Venice, bamboo rafts have historically have been a local form of travel but are now prized more for their tourism potential than their traditional day-to-day functions. It was for this reason that we opted to forego a raft ride and simply watch them from the shore. After enjoying a pleasant meal, it was time to head back to Yangshuo. Not being ones to take the same path twice, and not really knowing how we got there in the first place, we opted to return to Yangshuo via the opposite bank of the river. Little did we know, however, that despite all our troubles, getting to the bridge was the easy part. Heading downstream, we set off along the dirt road we hoped would take us back to the town center. Despite having started our trip early in the morning, we were now baking under the mid-day sun on a shadeless dirt road. Within minutes, the road turned away from the river and started to follow the route of a major highway. Facing the same dilemma we had earlier in the day, we opted to continue following the dusty dirt road we were on, sure that the highway would head directly into town. Riding along the shadeless dirt road, we were lost again. At least the view was spectacular. After biking for another 30 minutes, we started to have our doubts and followed a side road up a steep hill hoping to find someone who could guide us back to Yangshuo. Of course, this being rural China, English speakers are hard to come by, and our feeble attempts at directions got us little more than curious stares. Eventually, our butchering of “Yangshou” and our confused, helpless looks got us a simple gesture to go back the way we came. Clearly, this was not the direction to town. Back down the hill we had expended so much energy to climb, we were again faced with a choice: continue on the path we had come so far on, or admit defeat and return from whence we came. Never ones to admit defeat, we cycled on. It wasn’t long before we were joined by a family of Brits and a young Dutch backpacker who had caught up with us. They too were trying to find their way back to Yangshuo. At least if we were lost forever, we wouldn’t be alone. Between the seven of us, we had a decent idea of the direction of the river: to our left over the rolling hills and karst mountains. 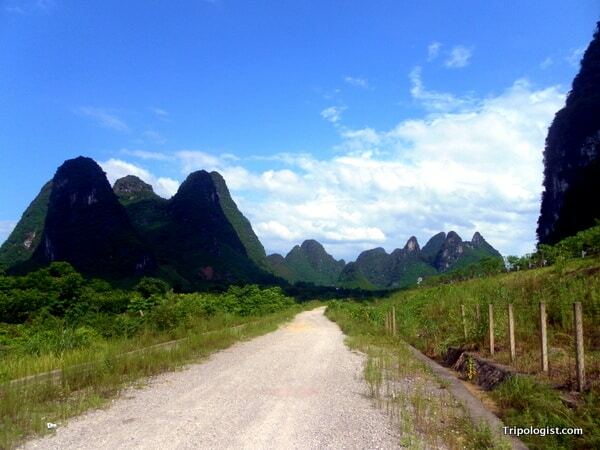 When we finally came across another local we simply asked, “Yangshuo?”. As he gestured towards the hills, a feeling of both relief and dread came over us. While we were happy to be heading in the right direction, getting our cheap, rented bicycles over the ridge would be no small feat. However, once we finally reached the ridge line, we saw exactly what we were praying for: the Yulong River. Unfortunately, we knew we had to cross the river, and with no bridges in sight, we knew we were still a long way from finding our way back to town. We headed down the hill knowing our journey was far from over. At the bottom of the hill, we came to a crossroads. As the seven of us discussed which way we should head, we were met by an opertunistic farmer. Seeing our plight, he mustered all of his broken English and instructed us to follow him through his rice paddy. While I’m not usually one to follow strangers into fields, I felt like we had no choice, and if worse came to worse, we outnumbered him 7 to 1. After a 10 minute hike through the rice paddy, made infinitely more challenging by our bikes, we finally reached the river’s edge. It was at this point that our savior let us in on his plan. He had a bamboo raft. Not the touristy kind, but an authentic home-made raft that he would be happy to ferry us and our bikes across the river with…for a mere $3 each. After a bit of bargaining, we all agreed to the plan. After all, how else were we going to get to our hotels? My wife and I were first, after loading our bikes on the flimsy raft, my wife boarded, followed by me. Unfortunately, as soon as I got on the raft, we discovered that, like most luxury liners, our tiny bamboo raft did not have an unlimited weight limit. We started to sink. My wife and our 2 bikes being paddled across the Yulong River on a homemade bamboo raft. Faster than you could say, “I don’t want to die in China,” I was off the raft and back on shore. Fortunately, this saved my wife from having to swim to shore as the raft quickly bobbed back to the surface. As my wife was couriered across the river, the six of us remaining discussed our strategy for getting across the river. In a discussion similar to the childhood game of having to get a fox, a chicken, and a bag of feed across the river, we finally mapped out our game plan, which we executed flawlessly over the next 15 minutes. Once we had all crossed and paid our captain his money, we were pointed in the direction of town and set about the long ride home. When my wife and I returned to our hostel, we were tired beyond belief. What should have been a 20-25 kilometer ride turned into double that thanks to our navigational blunders. However, I wouldn’t have had it any other way. Not only did we get to see small villages and beautiful scenery that were well off of the beaten path, but we got to ride on a bamboo raft in the traditional way. Instead of being over-anxious tourists waiting to get our picture taken on a sturdy, but sterile bamboo raft, we had gone the utilitarian route, using a home-made bamboo raft as a flimsy ferry across the Yulong River. Had we not gotten lost, we would have never had that opportunity. I learned that day that it’s okay to get lost. As long as you aren’t heading into the wilderness, you’re almost certain to find your way home. 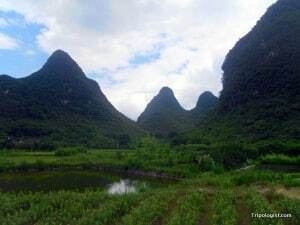 Sure, it might take a bit longer than expected, but the experience of getting off the beaten path and seeing the real heart of somewhere like Yangshuo County, China, more than made up for the temporary discomfort. ha we got lost there on bikes as well! I got lost with my bike there too, and I even had a map! It was also ridiculously hot and humid there the end of last June. BUT totally agree with you, it might be the best place in the world to get lost, I nearly enjoyed dragging my bike between rice paddles and repeatedly bashing my leg with the pedal. A very beautiful part of the world best seen off the beaten track. Thanks for your post and glad you got back safe in the end! You’re right. It is a great place to get lost. My shins were definitely bruised the next day from continually bashing them against the bike pedals. Thanks for the comment. I can imagine! My high school basketball jumping skills would have resurfaced in an instant. Haha. Riding on an authentic bamboo raft sounds like fun though. There are certainly worse places to get lost! We loved Yangshuo…the scenery is otherworldly and the ancient villages along the river were interesting to explore. I can only imagine the looks you were getting as you biked through their rice paddies! Great Post, Jim, thanks for sharing. I must admit, I would have been really nervous and uneasy about being lost in a foreign place, because I always fear the worst. However, that scenery is stunning. I imagine that truly was a wonderful place to get lost. It definitely was a beautiful place to get lost. Thanks for the comment. Thanks for the kind words, Henry. I’m glad you liked the story! Don’t feel bad – even locals can get lost on this route. 2015 Update: for better or worse, the local government have now paved this entire route, from Gongnong Bridge to Dragon Bridge (20km)! They have also planted a lot of trees along the road as they want to collect fees so guests can bike into the “Scenic Area”. Rumor has it that they will only allow bikes and electric carts here in the future, so hotel guests will need to park their cars in a large lot near Gongnong bridge and take a cart. While it’s better for the environment, it’s a little less wild than your trip a few years ago. Both the Yangshuo Mountain Retreat and Giggling Tree hotels offer good hand-drawn maps for the route. Safe travels!